I crossed “make the boys new quilts” off of my Summer bucket-list just in time for school to start. EVERY night my boys kick their top sheets off or to the bottom of the bed…so I gave up on top sheets and backed these quilts with a super duper soft minky (the silver is out of stock now). It was definitely an investment (it was $8.48 a yard when I bought it!) but it will be worth it if I don’t have to dig for that darn top sheet every morning. Because the back is minky I paid a long arm quilter to do the quilting. I’ve quilted with minky in the past but its not my favorite and requires a lot of basting spray/pins. Kathy did the quilting and did just enough to make it look great without making it too stiff… as minky backed quilts can be. The quilt is a so cute, but your son is even cuter! What a darling picture of him all wrapped up! He looks so cozy! What a sweetheart, your son. He really seems to love his new quilt too. It is great. I have never used minky as a backing but it really is a good idea for utility pieces. There are so many fleeces on the market right now and I am making kids quilts as well. I am on the search, thanks for the idea. It turned out really cute. I have never used minky on my long arm I may have to try that because just like your kids, mine kick off all the covers! What a cutie! (and the quilt looks great too!) 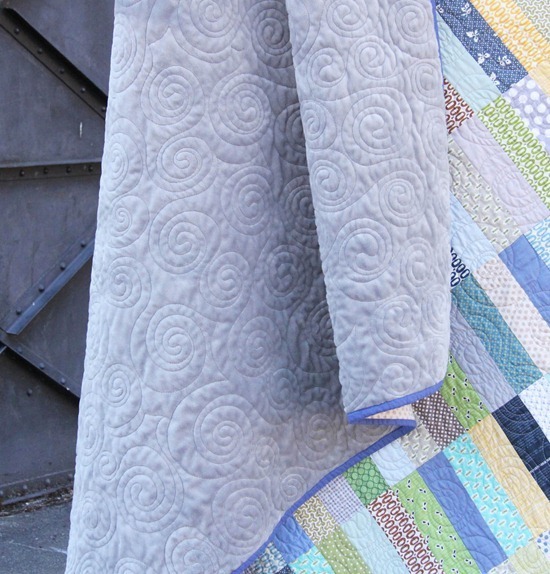 I'd love a minkie backed quilt for me–sounds wonderful! Beautiful! I want a cozy, minky backed quilt! What a great idea for the back. My boys do the same thing – scrunching the top sheet down at the bottom of their beds. Drives me crazy! Hmmmm, may have to add quilts with minky backings to the project list! Great quilt! tell them they can do magic with their new quilt…by sleeping longer in the morning…hopefully…. Oh my gosh – that is absolutely the best boy quilt I've ever seen. I LOVE it!!!! Really sweet photo, great quilt! Fabulous quilt! Your son looks like a real sweetie mixed in with some fun under the quilt. Great boy quilt! I love the colors and that minky looks heavenly. What is it with little boys being anti-sheet? All three of mine won't leave the top sheets on their beds, either so I don't even try anymore, I just use them for quilt backs! it's FABULOUS!!! love the colors and the the size of the rectangles!!! That backing is beautiful! I love how it turned out. I love your *yawn* it totally made me laugh! My kids do this too! I don't even put sheets on anymore either. They each have a blanket they've loved since they were born, but now that they're to big for their blankets, I'm going to have to do something similar or they'll freeze this winter! Love the colors and how you did the stripes! Lucky boy, that thing looks super cozy! He looks well wrapped and a happy camper.Fun quilt. I skip putting on the top sheet on my kids beds. Since I've begun sewing when I buy new sheets for them I take the top sheet and add it to my fabric stash! It looks fantastic and he looks pleased as punch with it! What a beautiful and comfy quilt for your adorable son. What a cutie – those fabric colours are just made for him. What an absolutely gorgeous little boy you have – such a sweet photo. Glorious quilts, lucky boys I'm sure they will cherish them forever. I made my daughter a patchwork quilt when she was tiny, she's 26 now and still has it on her bed. And it still looks good! very cute! I used a Shannon Fabrics Cuddle kit – that minkee-like stuff – used those strips on the top, a soled piece of the same minkee-like fabric on the back. And I put batting in it! Talk about HEAVY! but it sure is soft! Love the quilt and the kiddo! Totally awesome! Love the quilting, too. I really want to try to back a quilt with Minky – thanks for the heads up on best way to quilt it! Love your new boy quilts you did – and man is he ever C.U.T.E.!!!! That smile… those curls… :O) even if he gets you up early – what a sweet face to greet you! Ours were usually up about 5:30 oy… UNTIL puberty hit… then I couldn't get them out of bed LOL…. first you want them to sleep, then you need them to GET UP! Enjoy – these sweet years will fly by!!!! My baby is 17 now and a senior… and yes… still having trouble getting up – sleeps through his alarm! It wakes the rest of us – just not him! What a great idea! My grandkids do the same with their sheets. That's just what I will do with their quilts. Thanks so much. I could never give up my sheet. I'd rather not have a blanket. Lovely quilt. I had to laugh at the sleeping reference. I remember the days of early risers. Then they get to be teenagers and you don't see the until noon unless you wake them up. He is adorable, and so is the quilt! My 5 year old bunches the top sheet at the bottom of the bed, too. What's up with that? Love this quilt!! He looks so cute and happy :)! Am also admiring your perfect matching up. I tried to be very precise in my measuring on mine and still found they didn't match that well. Practise makes perfect?! And I made my girls a quilt because the duvet was too much! But they are obsessed with footie pajamas so the quilt is often too much now. Sigh. My daughter wants a minky backed quilt but I wasn't sure whether I should put batting in between or not…did you? I also have 2 boys and just love reading your blog. There is so much to inspire one here! 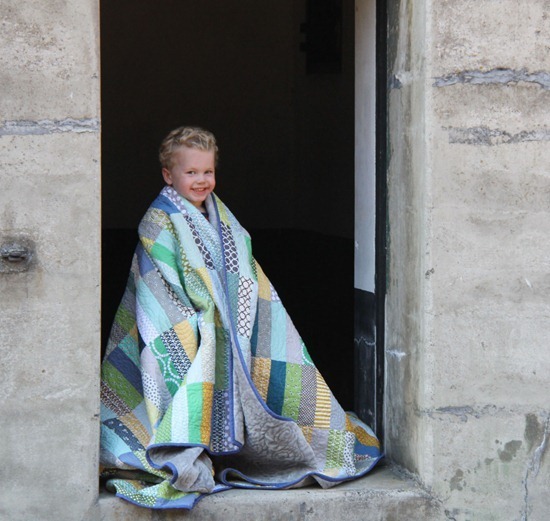 The quilts are fabulous and your boys are so cute! And don't worry, you're not alone in the early risings. My boys are almost always up by 5:30 or 6 – no matter what time they go to bed. This is magic! Great pics and a wonderful quilt! 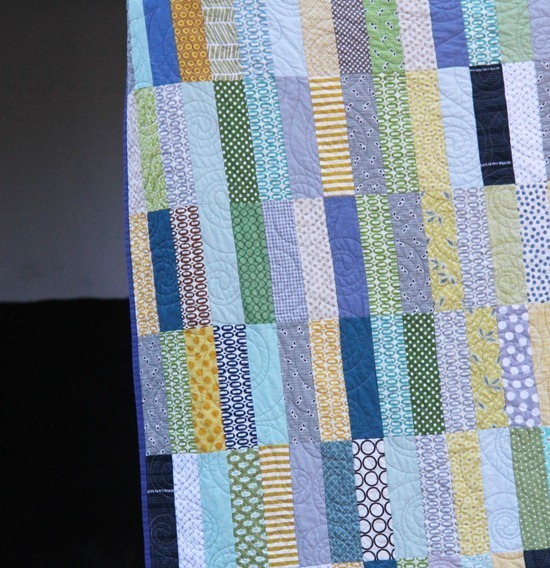 This is adorable — I love the spiral quilting against the straight patchwork lines! So, when you use Minky for the backing, do you still put batting in your quilt? This looks so soft and snuggly! 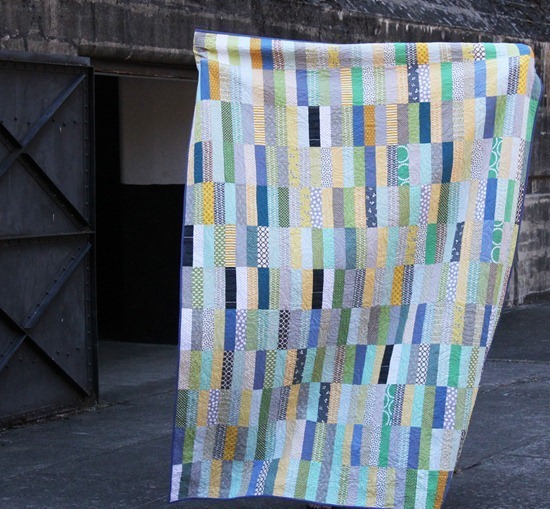 Hi Allison, thanks for writing about this quilt! I really love the design and I'm almost done with my own version for my kindergartener!! I started it not long after you posted your top and was hoping to see yours before I had to figure out how to quilt mine. :) I love what you (your longarmer) did, swirls are just what I was thinking too! Anyway, good job AND thank you so much for the inspiration.